The award recognizes the hospital’s work implementing quality improvement measures outlined by the American Heart Association/American College of Cardiology Foundation guidelines for heart failure patients. 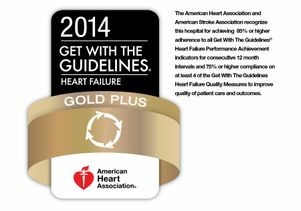 This marks the sixth consecutive year that Ronald Reagan UCLA Medical Center has been recognized with a quality achievement award for its work treating heart failure. Get With The Guidelines – Heart Failure is a quality improvement program that helps hospital teams provide the most up-to-date, research-based guidelines with the goal of speeding recovery and reducing hospital readmissions for heart failure patients. Ronald Reagan UCLA Medical Center earned the award by meeting specific quality achievement measures for the diagnosis and treatment of heart failure patients at a set level for a designated period. These measures include proper use of heart failure medications, including beta-blockers, ACE inhibitors, aldosterone antagonists, and diuretics, while patients are in the hospital. Before patients are discharged, they also receive education on managing their heart failure and overall health, as well as referrals for early follow-up. “Ronald Reagan UCLA Medical Center is dedicated to improving the quality of care for our heart failure patients, and implementing the American Heart Association’s Get With The Guidelines – Heart Failure program helps us to accomplish this goal by tracking and measuring our success in meeting internationally-respected guidelines,” said Dr. Gregg C. Fonarow, director of the Ahmanson-UCLA Cardiomyopathy Center and co-chief of clinical cardiology, David Geffen School of Medicine at UCLA. According to the American Heart Association, about 5.1 million people suffer from heart failure. Each year, 825,000 new cases are diagnosed and more than 275,000 people will die of heart failure. However, many heart failure patients can lead a full life when their condition is managed with proper medications and devices and with healthy lifestyle changes.